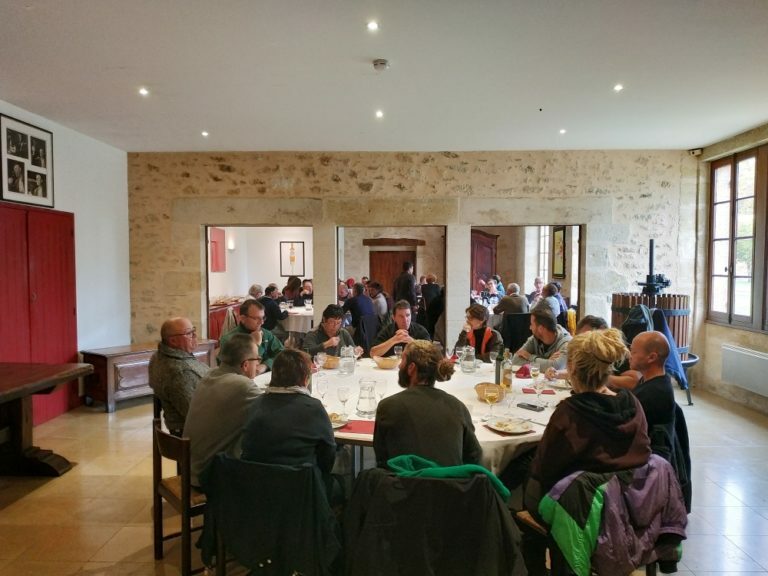 Tradition has it that each harvest ends with a festive meal hosted to thank the harvesters and the estate’s year-long team for their hard work. Known as the “Gerbaude” in other regions (like the Medoc), this annual end-of-havest gathering is called the “Acabailles” in the Sauternes and Barsac appellations. While throughout the 6 to 8 weeks of harvest at Château Coutet, daily lunches are served in one of the historical round barns on the property, the “Acabailles” is celebrated in the formal dining room adjoining the Coutet’s cellars. This time of sharing is a special moment for everyone, from the new pickers of Coutet’s golden berries, to those who have contributed to more than fifteen harvests and, finally, to the dedicated staff that has relentlessly watched over the vineyard all the months leading to the picking.